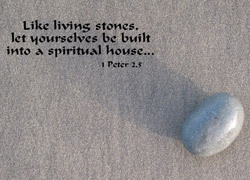 The First Epistle of Peter. It has traditionally been held to have been written by Peter the apostle during his time as bishop of Rome. The letter is addressed to various churches in Asia Minor suffering religious persecution. The author's use of Peter's name demonstrates the authority associated with Peter. The author identifies himself in the opening verse as "Peter, an apostle of Jesus", and the view that the epistle was written by St. Peter is attested to by a number of Church Fathers: Irenaeus (140-203), Tertullian (150-222), Clement of Alexandria (155-215) and Origen (185-253). If Polycarp, who was martyred in 156, and Papias alluded to this letter, then it must have been written before the mid-2nd century. However, the Muratorian Canon of c. 170 did not contain this, and a number of other General epistles, suggesting they were not yet being read in the Western churches. Unlike The Second Epistle of Peter, the authorship of which was debated in antiquity, there was little debate about Peter’s authorship until the advent of biblical criticism in the 18th century. Assuming the letter is authentic and written by Peter who was martyred c. 64, the date of this epistle is probably between 60-64. This epistle is addressed “to the strangers dispersed through Pontus, Galatia, Cappadocia, Asia and Bithynia, elect,” (five provinces of Asia Minor) though it otherwise appears to be addressed to Gentiles rather than to the Jews of the Diaspora. Some of these areas were evangelized by Paul of Tarsus according to Acts 16:6-7, 18:23. The Epistle is attentive to keeping with the teachings of Paul, and is likewise in conformity with the teachings expressed in the canonical Gospels. The letter blends moral exhortation with catechesis, and especially relates fidelity even during suffering with the life of Jesus. The Epistle contains the remarkable assertion: "For unto this end was the gospel preached even to the dead, that they might be judged indeed according to men in the flesh, but live according to God in the spirit" (4:6). This passage has few parallels in the New Testament (c.f. Eph 4:9-10, 1 Peter 3:18-19, John 5:25), though it has been argued that the various assertions that Christ was “raised from the dead” presuppose that he journey to the abode of the dead before his Resurrection (e.g. the Catechism of the Catholic Church, 632). This teaching became included in the Apostles’ Creed, reading: “He (Jesus) descended into Hell.” The earliest citations of the Creed, however, (for example that of Tertullian) do not include this line (or several others), and the Apostle’s Creed was not well known in the East. From the doctrine of the Harrowing of Hell emerged various medieval legends.